The Beauty Secrets I've Learned from Mom. I've been spending a lot of time with my Mom lately. We are very close already, but as she is getting older I have learned to appreciate the time we have more. Our talks are longer and our time together is more meaningful. It's funny how things have changed; my Mom now comes to me for beauty secrets. My Mom asks me what creams and serums she should use and sometimes asks for a lipstick or nail polish out of my beauty closet. I realize though, that the real beauty secrets are those that I learned from her many years ago. My Mom has taught me quite a few beauty secrets growing up and none of them have to do with makeup. Beside building inner confidence and that true beauty comes from within - be a good person and you are beautiful on the inside - my Mother had a pretty simple beauty routine. It is one that I realized stuck with me through the years. These really are my beauty secrets and are at the core of my beauty routine. My beauty secrets include washing my face each night before bed. It is one of those things I do as I strip off the dirty clothes of the day and get in freshly washed pajamas, I wash away the makeup and dirt from the day as well. It is such an important step that has just become routine over the years. I could not imagine going to bed without washing my face first. My Mother also taught me to use a gentle moisturizer after washing my face and to apply lip balm as a final step in my nighttime beauty routine. This is a simple routine that I have been doing each night before bed since I have been about 12 or 13 years old. These simple beauty secrets are important ones that have changed my skin for the better over time. I don't know if I would have made them a habit if I didn't learn them from my Mom at such a young age. Real beauty is shaped by real women. Celebrate a woman who has influenced your #BeautyStory by sharing the beauty traditions or life lessons that were passed on to you. 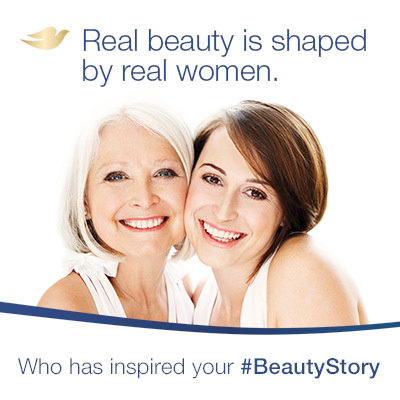 Visit the Dove at Walmart site to see how one family has used Dove to shape their #BeautyStory for 4 generations and share your story. Disclosure: This is a sponsored post for which I was compensated in partnership with Lunchbox. All opinions are my own.